I picked this can of lemonade up from one of my favourite food haunts in Birmingham. The owner commented on the multitude of strange items I was buying and for the first time ever in any shop I blurted out that I write for a food blog. I don't know why I did it. It was more of a surprise to me than the store owner. Madly he'd actually heard of us and thanked us for writing about his products over the years. So I'd like to say a big "Hello!" and thanks again for knocking some loose change off the bill there. Every little helps when you're an ageing student! 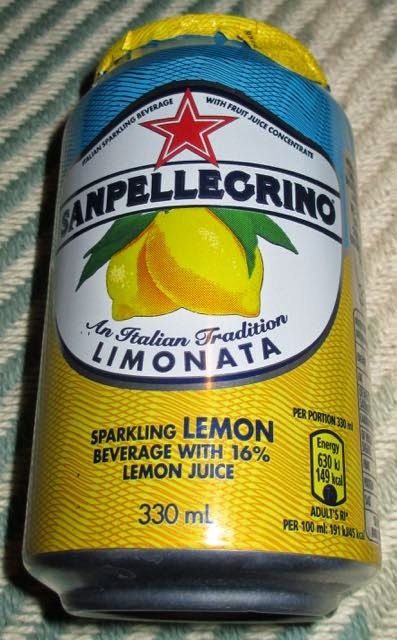 When I showed Cinabar the can she mentioned that this Italian lemonade is pretty popular. It's not only one of her friend's favourite drinks, but also is served in some high street Italian restaurants. Well this is the first time I've sampled it and couldn't help but pop the can as soon as I'd heard so many good things about it. There was a decent smell of lemon from the opened can, which was a good start. I poured the fizzy energetic cloudy drink out into a glass and took a sip. Considering this drink has quite a bit of sugar in the ingredients there was a considerable sourness. I even passed the lemonade to Cinabar who also made the same strange "whooo" noise after taking a swig. I found this refreshing sour lemonade drink a face twisty treat with bags of flavour. Perfect for washing down flavoursome Mediterranean food or anything else for that matter. Either that or just have it on its own, especially if you need a "pick-me-up" or a wake up call on a tiresome afternoon. 330ml can with 149 calories, 0g of fat and 33g of sugar. Ingredients included; water, reconstituted lemon juice (16%), sugar, carbon dioxide, natural lemon flavouring, and antioxidant; l-ascorbic acid.